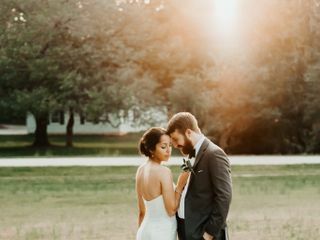 - From the first time I contacted her to the morning of my wedding, Patricia was incredibly responsive via email and got back to me almost immediately each time I reached out. - Patricia is seriously a hair GENIUS! I have super fine, short/medium length hair and she suggested at my trial that I buy an extension for the wedding day to make my bun bigger. 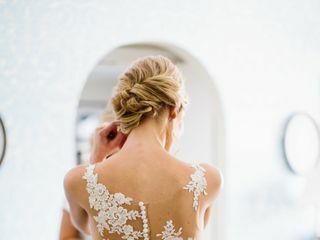 She perfectly incorporated the extension into my updo and added a ton of texture, and my hair looked completely natural and thick on my wedding day. My bridesmaids, mom and mother-in-law were incredibly happy with their hair too. - Patricia truly LISTENS to what you want. We did a trial before my bridal portraits a few months prior to the wedding, and I noticed some things I wanted to tweak after getting the photos back. Patricia was completely receptive to my feedback and made the adjustments for the wedding. She also truly listened to what my mom and mother-in-law wanted in terms of their hair, and they were both very pleased. - Patricia is FAST! I don't typically love the amount of time involved to get my hair/makeup/nails etc. done, so I really appreciated how quickly she works. - Patricia includes gratuity in her prices, which I really appreciated as the bride. One less thing to worry about on the wedding day. Patricia did a fantastic job making me feel and look beautiful on my wedding day! I was so worried about finding a style that would capture the look I was going for, and Patricia did not disappoint! She was willing to work with any requests I had and personalized my experience to give me the best results! Patricia is a true professional and artist, and transformed my fine, flat hair into a perfect updo! I was adamant about natural makeup and she did not disappoint their either. I felt so comfortable and beautiful on my day and that is thanks to her! If you are looking for someone who will pour their heart into your day, as well as keep up with you after, Patricia is your girl! Christina I enjoyed you so much! Everyone was a pleasure to work with. I am happy you trusted me with your concern of the amount of makeup. Thank you dearly! Many blessings in your marriage. 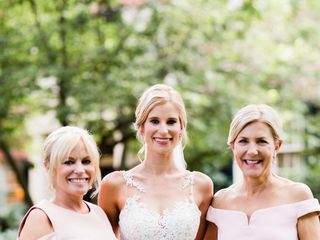 I absolutely loved having Patricia and her team do hair and makeup for my bridal party on my wedding day. From start to finish, she was incredibly responsive via email and setting up a time for my pre-wedding trial run was easy. Patricia was great at taking all my ideas for my wedding day look and translating them into reality. I was going for a classic bridal look with an updo and everything was perfect! The team was prompt and we remained on schedule the entire morning. We loved the end result and would definitely recommend! Patricia was flexible with scheduling the run through considering my work schedule. She listened and implemented exactly how I wanted my hair and makeup. She had great suggestions! She brought Sarah for the day of the wedding, who was also wonderful. I was worried about looking too "done up" considering I don't normally wear a lot of makeup, but she did a great job making me look special but not overdone! They are both easy going, fun to be around, stayed perfectly on schedule, and made all the girls look wonderful! Working with Perfection by Patricia on my daughter, Kaitlyn's wedding day, was a wonderful experience! The team of beauty consultants were very professional but fun and worked in a timely manor to have all 10 bridesmaids, the bride, and both moms ready for the photos in the afternoon! The hair and makeup held up perfectly thru the night!! Thanks so much! It was SUCH a pleasure getting to know you!!! I used Perfection by Patricia for my wedding hair and make up and for my bridesmaids hair and makeup. 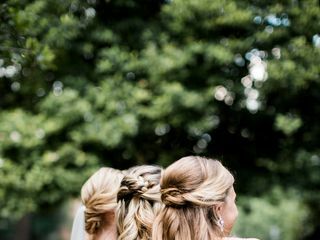 Patricia did all of my bridesmaids hair exactly how they wanted it in such a quick timeframe without compromising quality. Tiffany did all of the girls makeup as well and everyone looked beautiful. Patricia was so accommodating to what I wanted and made any changes I requested. 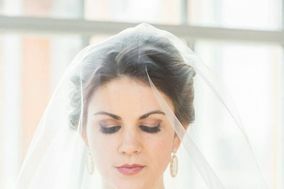 My make up held up through many many tears on my wedding day. I felt like a princess by the time she was done with my hair and makeup and I really couldn't have asked for anything better. Sarah and Kathy did a great job! I know I will look back on my photos and feel every bit as beautiful 5, 10 and even 50 years from now as I did that day! Thank you for everything Patricia! I can’t recommend you highly enough! Oh my goodness!!! What a sweet review and those pictures you provided!! :) you are gorgeous girl! Many blessings to you and your marriage!! Perfections By Patricia was the well... Perfect!! They made me feel like a beautiful model on my wedding day. I had to change locations of where my bridesmaids and I were getting ready last minute and they were so flexible. They then spent the whole morning of my wedding day doing my girls hair and my hair/makeup and it was soo beautiful. They also joined in in our fun and it felt like they were close friends! If you are looking for wedding hair and make in the Raleigh area look no further than perfections by Patricia! Seriously they are amazing! Oh my gosh how sweet. We feel the same way about all of our brides.. .close friends :) We really do come together and feel like family. It was a pleasure!! Patricia is amazing! I'm so thankful to have met her and have had the opportunity for her to do my hair and makeup for my wedding day. She made me not only look beautiful, but feel just as beautiful. She was professional and quick to respond to every message I sent her along the way. She made the process smooth and easy for us. We are so thankful that she was part of our special day and highly recommend her! Thanks Emily!! many blessings and happy marriage!! Patricia and her team were amazing! From the first inquiry through the wedding day, Patricia was super organized and thorough. I greatly appreciate everything she did for me, and I loved the look of all of my bridesmaids, MOB, MOG, and myself. Everyone looked polished but natural which was what I wanted. Everyone complemented our hair and makeup, and besides one bridesmaid taking longer than planned for hair, everyone was on schedule. I appreciate the level of service for the price that Patricia provided. She was one of the few vendors I found that had packages for larger groups of people instead of one flat rate per person. Wow thanks Emily for the awesome detailed review. We are so happy for you!!! I worked with Margo on my wedding day and everything went so smoothly. Although I had a very small wedding, we still had quite a few ladies who wanted their hair and makeup done. Margo arrived on time and ready to go. I was especially thrilled they sent out a schedule ahead of time-- it was one less thing for me to worry about and organize! Despite having so many people to complete in one day, the team finished early! Thanks for making me feel and look beautiful on my wedding day! So awesome to hear!! Thank you so much! Many blessings! There is no words to describe how amazing working with Patricia was! She is kind, fun, engaging, and the best hair and makeup around! She put together a rockstar team. She is flexible and is able to a home or the venue. I feel like I made a friend for life with Patricia! Patricia was incredible! Her work is outstanding. Beyond that though, she made my mom, friends, and I feel very comfortable and beautiful!! Patricia and her team were an absolute pleasure to work with. The talent, professionalism and overall attitudes were above all else. My entire wedding party felt their best on wedding day and it was all thanks to Patricia! Thank you so very much. So honored you chose PbyP! Patricia and her team were amazing to work with. There were 5 of us (my mom, my 3 sisters and myself). We looked so beautiful and both the make-up and hair lasted all night and even through the after-party! Patricia and Kathy were absolutely amazing! Patricia did my hair & makeup trial and day of, I could not have been any happier with the way both my hair and makeup turned out! She helped make my wedding day the most beautiful day of my life, and I can't thank Patricia enough! Both Kathy and Patricia were so professional, sweet, and they're just both super talented. I don't think I've ever seen a bridal party with more beautiful hair. I just can't put into words what an amazing job they did. I cannot sing their praises enough! Thank you so much Patricia and Kathy! Oh thank you so very much!! We are so happy.you chose PbyP!! Patricia was absolute perfection! Very talented and very capable of meeting any needs. Patricia and her ladies were able to do exactly what my bridal party wanted and everyone looked beautiful. 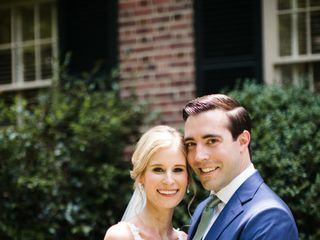 Highly recommend Patricia for your hair/makeup on your special day! Thank you so very much! Thanks for trusting us with your big day! Patricia and her team did a fantastic job at my wedding for both hair and makeup! They made every single person look natural and beautiful. Not only that, but every person doing hair and makeup was a joy to work with. We had a lot of people getting hair and makeup done (21! ), and Patricia was able to stick to the schedule keeping the entire day on track while making everybody look gorgeous! Wedding guests were commenting all night about how great everybody looked. I can't thank Patricia and her team enough, and I will definitely be working with them in the future! We had so much fun with your large group!! Thank you a million times over for choosing PbyP!! Can't wait to see pics! Working with Patricia was a wonderful experience! 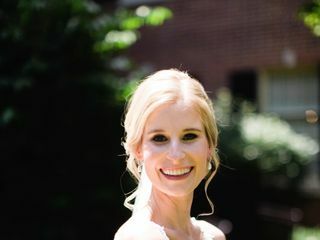 I was VERY nervous about selecting someone to do hair and makeup for my wedding because I have had bad hair and makeup experiences in the past and am a perfectionist. Talking with Patricia helped to put my mind at ease when she said that she would be the one to work with me and that we could do a trial run. She was so kind and patient with me at the trial run when I had difficulty explaining the look I wanted to achieve. She was able to listen to my (often contradictory) ramblings and style my hair in a way that I loved. In the weeks before my wedding, Patricia put together a timeline for me to share with my bridal party so that everyone knew what time they had to be in a chair for their applications. This was just another aspect of working with her that put a stress prone bride's mind at ease. At the end of the day, all my girls looked amazing in person and in the photos. Everyone was very happy with the results! So happy to hear!! Many blessings to you and your marriage! I would definitely recommend Patricia and her team! A month before my wedding, my previous booked hair stylist and makeup artist had to unexpectedly cancel on my wedding - I emailed Patricia in a panic and she was so great in her flexibility and swiftness to book my wedding day for me and 8 of my bridesmaids! She was so organized, ready to perform to her best at last minute and was so encouraging throughout the whole wedding day! I can not speak highly enough about her! So so happy it all worked out!! Thank youuu!! The ladies that Patricia brings in are amazing! Yay! So awesome to hear! Patricia and Margo were incredible! Friendly, efficient, and fun to be with the morning of my wedding. From the very beginning, she was prompt in communication which alleviates anxiety while wedding planning. During the trial, Patricia listened to what I wanted and executed it beautifully! As someone unfamiliar with makeup, she guided me to create a look that was beautiful, but not over the top. 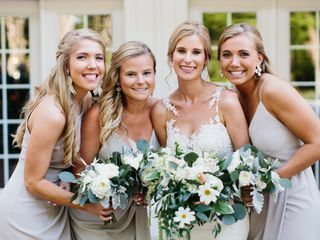 Everyone in my wedding party wanted something different and they made each look fantastic! Hair and makeup lasted all night without problem. I highly recommend her! Eeek!! Lindsay your group of gals were so fun!! Thank you SO much!! Patricia and her team are amazing to work with! The hair and makeup for everyone in the bridal party was gorgeous! Both the hair and makeup lasted all night despite a lot of dancing (until 2AM) and having cake smashed in my face! Leading up to the wedding, Patricia was very responsive to emails which was definitely appreciated. She was also flexible with scheduling and changes to the look, including some on the day of the wedding. I would highly recommend Perfection By Patricia to any bride who wants to look stunning on her wedding day! Kristin it was such a pleasure!! Thank you for the kind words! Efficient, organized, and amazing work!! Bridal party looked amazing and hair/makeup lasted all night! Highly recommend. Thank you SO much for allowing us to be a part of your day! !